You are here: Home / Guest Posts / Mommy’s Lil’ Monster Bash–Guest Post from Jennifer of The Martha Project! Mommy’s Lil’ Monster Bash–Guest Post from Jennifer of The Martha Project! I was so excited when Jennifer of the blog The Martha Project agreed to do a guest post for Mommy’s Lil’ Monster Bash. Jennifer is super creative, super crafty and super honest. I love reading her blog and you’re going to want to follow her on Twitter, because she is hilarious. She also loves Halloween. I don’t know if I can just say love. She MIGHT just have a slight obsession. Which is all right with me! We moved into our house in June. Halloween was the first Holiday for us. I went out and bought the 5 bags of candy decorated for fall. And sat on the porch waiting for all the children to come. What? So you’re trying to say that our cul-de-sac candy doesn’t count as much as the straight street candy? I could see they were right. Just beyond our cul-de-sac the treaters were out and walking right past our little section. I needed more treaters and I was going to get them. 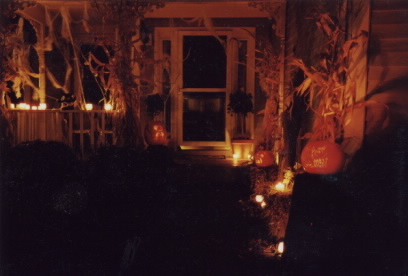 And this my friends is how my neighborhood turned me into a Halloween freak. The Next year I got the Martha Stewart magazine and saw some home made tombstones in it. I figured I would add some of those and I got a fog machine too. Did this work? Not much. Determined to get some treaters down our street, The next year I really ramped it up. I thought it would be cool if I added a spider web tunnel over my walkway. So I did. And added some black lights a lot of spiders, bats and a few skeletons. This year a newspaper found my house and I got interviewed so guess what? I got me some treaters this year. Yep, I did. 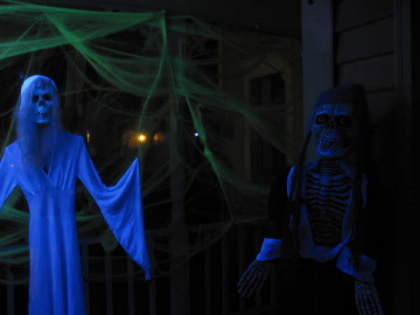 the porch got some spook added. 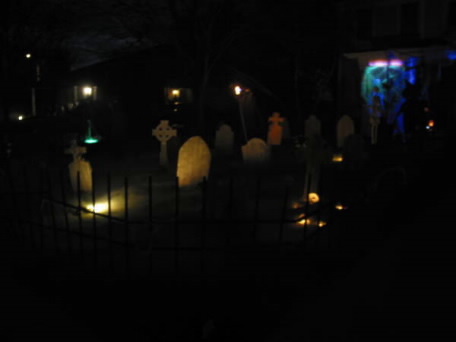 And the yard got a few more tombstones each year and I added a fence. 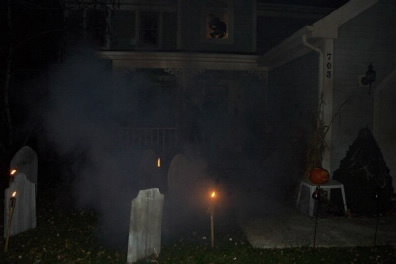 This display has grown to my whole fenced front yard including gate that goes across my driveway, 3 fog machines, a mausoleum, many different figure props, and the big draw, the candy chute. 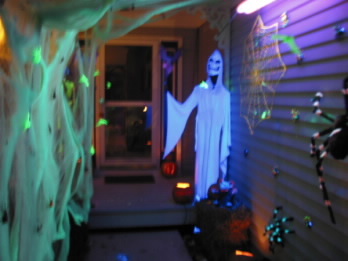 The candy chute is something I made so that candy gets dropped down this pipe from inside my house and comes out the skeleton’s mouth on the outside. And now basically I’m at the freak level. But the question is? Do I have trick or treaters? Last year I made 250 treat bags. If you haunt it, they will come. -This is just a small sampling of pictures. It has grown to my whole front yard on both sides. Please visit themarthaproject.com for more pictures and information on how my Halloween freak manifests itself. Boo! Mommy’s Lil’ Monster Bash–Guest Post from Abbie of Greening Sam and Avery! Mommy’s Lil’ Monster Bash–Recipe from Kristen of The Wilson Family! Oh WOW!! 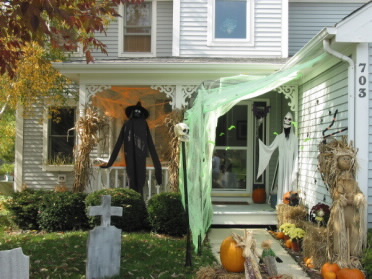 I love love love your Halloween decorations! I love that your a Halloween Freak!! 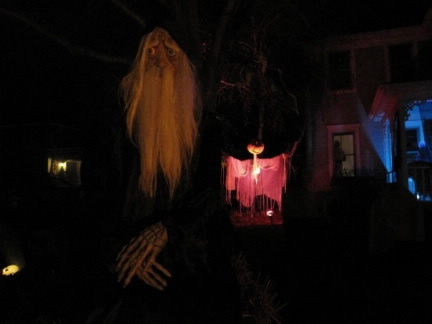 So am I… and my kids love to drive around and look at Halloween decorations… We would for sure trick or treat at your house!! 🙂 Well done!! This is why you ARE the Next Martha. Awesome. Yeah, you're kind of a freak. But, it's part of your charm. I LOVE halloween. And my kids know that. They're gone all day just so I can pull the boxes up from the basement and decorate. It is just so much fun!